Everyone who ever had a cat or is a cat lover knows the importance of keeping the kitten in good health, and some of the most commonly faced problem include different types of ear infections which must be dealt with as soon as they are noticed. 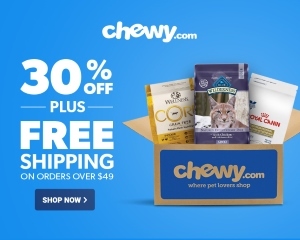 Therefore, in this article we are going to review some of the best cat ear cleaners available on the market today, so that your beloved kitty will remain healthy and happy. At one point or another every cat will have the misfortune to develop an yeast and fungal infection which will lead to either an acute or chronic otitis, thus, getting the best treatment is invaluable. 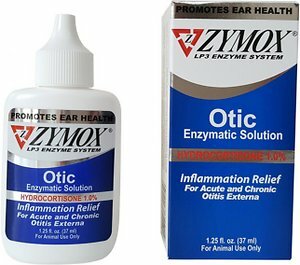 The Zymos Otic with 1% Hydrocortisone represents such a solution that will effectively deal with these types otitis, due to the fact that its composition contains three different types of enzymes that are antifungal, antibacterial and antiviral, which will effectively destroy not only antibiotic resistant microorganisms, but Staphylococcus infections as well. In regards to the 1% Hydrocortisone, it must be mention that its main function is to ensure a high level of relief from inflammation and itching, acting on one hand as a cleaner, and on the other one, as a very effective treatment. Please note that this product must not be used on pregnant or lactating females and on punctured ear drums! As for the ingredients of Zymos Otic 1% Hydrocortisone, the product contains the following: Glycerin, Hydroxy Propyl Cellulose, Deionized Water, Lactoferrin, Benzyl Alcohol, Propylene Glycol, Potassium Iodide, Hydrocortisone 1%, Dextrose, Glucose Oxidase, Lysozyme, and Lactoperoxidase. 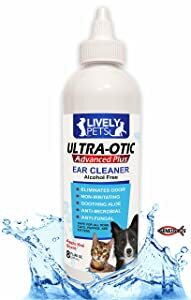 With an alcohol free formula that contains a concentration of Aloe, this product will not only clean and deodorize the pet’s ear, but will also act against the damaged tissue that’s left behind from infections and mites. Suitable for both cats and dogs of all ages, Ultra-Otic contains a unique compound named “EDTA,” that will effectively inhibit bacterial and fungal growth and will reduce the occurrence of mites and infections. Moreover, with the help of an active non-irritating ingredient that was used in Ultra-Otic’s composition, yeast infections on the skin will also be targeted. Utilizing this product will ensure that your pet will get rid of skin rashes, infections, bacteria, fungi and viruses with ease, thanks to a unique anti-fungal and anti-microbial formula. When applying the solution, make sure that your pet will not lick it until it is dry, and of course, needless to say, despite the fact that Ultra-Otic can be purchased without a medical prescription, always consult a vet before using any product on your pet. Another great product for both cats and dogs is the Petpost Cleaner that represents a far safer alternative to the traditional treatments that contain irritants, chemical medication or pesticide. 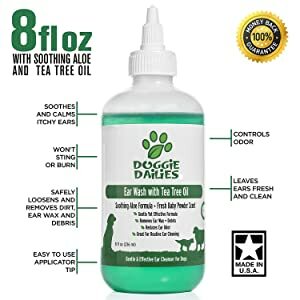 This product is made from all natural derived ingredients, that deals with sore ears, clogged ear canals, bad ear odor, and naturally, yeast infections and ear mites. 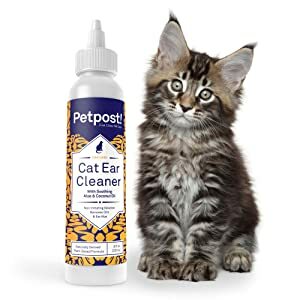 What makes this product different from the traditional ones, is the fact that it doesn’t just clean your cat’s ear, but it also treats current infections and prevents future ones to appear. Moreover, because the product uses the purest coconut and palm extract, Petpost will also reduce itchiness and remove bacteria that triggers different ear infections. Furthermore, this product comes with an easy-application nozzle that will help administrate the solution. Do keep in mind that Petpost was safely tested can be used for all cats and kittens that are at least 6 weeks old! 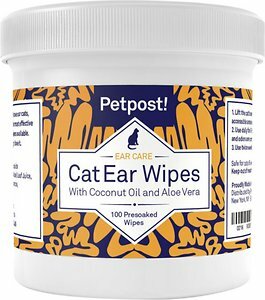 Having the right concentration of Aloe Vera and coconut oil, these ear wipes are definitely to be considered when your cat is dealing with ear infections, dirty ears caused by wax and dirt, mites or yeast infections. Specially designed to be the most effective and safest one the market, using these ear wipes will get rid of any ear infection that’s caused by bacteria, fungi, or ear rashes. Easy to be used, the Petpost wipes were created to ease one’s work when treating their pet. With all natural ingredients, you can be sure that your cat will get its ears cleaned and treated without any struggle on your part. The product contains the right dosage of Aloe Vera and coconut oil, thus, your cat will experience one of the best treatments that is opened to the general public without a medical prescription. Furthermore, these wipes contain disodium coco-glucoside citrate, water, leaf juice, fragrance, glycerin and phenoxyethanol, which ensures the quality of the treatment and its efficiency. The last product that we’re going to look at, is the “Doggie Dailies,” which is an effective cleaner for both cats and dogs! Containing a special combination of tea tree oil, witch hazel, Aloe Vera and Echinacea, this product delivers great results, and due to the pleasant light scent, the solution will not make your cat uncomfortable. It can be applied with ease as it comes with an easy-to-use applicator tip, and it can be used on cats of all ages. Developed in the United States and being FDA registered, you have the guarantee that this product will get rid of your cat’s itchy ears and maintain it healthy and clean. Moreover, the combination of ingredients will also reduce ear odor, prevent yeast infections and ear mites, and will effectively remove wax, dirt and debris. One thing to be noted here is the benefit of the tea tree oil which acts as a natural disinfectant due to its an anti-fungal, anti-inflammatory and antibacterial properties. Even if your cat didn’t have an ear infection by now, it’s good to stay informed and to know what types of infections can occur. Therefore, let’s see an overview of the top four ear infections that a cat can get! Aural polyps is one of them and represents an inflammatory growth in the middle ear of cats. Unfortunately, modern science hasn’t determined yet why they appear and can extend either inwards into the pharynx or into the outer ear of the cat. Ear mites is another common problem that causes itching and irritation in a cat’s ear, but luckily, as this article showd, there are very good remedies for such a situation. Otitis externa is one of the primary reasons why someone will bring a cat to the veterinarian. It’s an inflamation of the external ear canal distal to the tympanic membrane, and can cause bad odor, exudate, headshaking, erythema and pain in the ear. Chronic otitis is one of the more serious infections since it can lead to rupture of the eardrum or permanent narrowing of a cat’s ear canal. It’s generally caused by allergies, growths or parasites, and treatment will always begin with cleaning the ear with products such as the ones presented in this article. It’s no secret that some people prefer natural home remedies, thus, if you are one such individual you might be interested in the following holistic treatment that addresses cat ear infections. By mixing warm water and apple cider vinegar you can prepare a solution that will efficiently kill mites, ringworms and allergens that can trigger itching and acne. To do this, simply dunk a paper towel in the solution and squeeze out the liquid into the cat’s ear. Please make sure that the apple cider vinegar is properly diluted as it can be rather abrasive to a cat’s tender skit, especially for young kittens which require an more diluted mixture. So there you have it. The next time your cat will have an ear infection, make sure to come back to this article for the best treatments that you can give to your beloved kitten, and of course, if you know someone who is already dealing with this issue, then share the article with them so that their cat can get the same excellent treatment that yours will get in the future!